On April 9, 1968, Kansas City high schoolers, dressed in white shirts, ankle socks, and saddle oxfords, peacefully marched in front of City Hall out of dismay that their city wouldn’t close public schools for Martin Luther King, Jr.’s funeral. Next thing, police threw tear gas. Then the city exploded with firebombs, gun battles, and 1,700 National Guardsmen. I was eleven years old watching this unfold on the snowy screen of our black and white TV, wondering how our city, known for its stockyards and horse shows, could turn to such violence. After two days of mayhem, three city blocks smoldered, six blacks lay dead, and the world shifted on its axis, at least from my perspective. I saw danger everywhere. A spring breeze could spin into a tornado. Poisonous snakes could strike from a clump of grass. A ride to Grandma’s could end in a fiery crash. 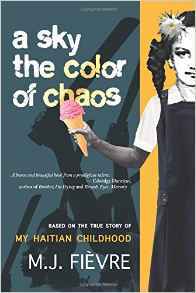 I recalled these anxious times while reading M.J. Fièvre’s A Sky the Color of Chaos, a story about a child growing up in the heart of violence, during the turbulent rise and fall of President Jean-Bertrand Aristide in Haiti. Every night she lies in bed listening to gunfire, screams of a neighbor being beaten, and footfalls of marauders running up and down her street. Once her father flew into an uncontrollable rage because he couldn’t find one of his records and accuses the author of stealing it. She prepares for a beating with his belt, but the father tells her, the punishment for thieves is burning of the hands. Before the child is injured, the frantic mother discovers the misplaced album. The knife is yet another symbol of Fièvre’s desperation to find stability in a nonsensical world, where her father believes demons are possessing their house and the sister attempts suicide by jumping off the balcony. Violence begets violence. In a fit of rage and frustration, the author uses the knife to hack into the wooden lockers in the school gym. Later she throws a bottle of Fanta at her sister, spraying her with glass. A Sky the Color of Chaos is a harrowing story. The footnotes shed some light on political events and define Haitian terms, but, for me, they pulled me out of the narrative, often sending me on a factual hunt across the Internet. Tucking this information into the narrative might have been less distracting, even adding to the narrative’s tension. Even so, I was totally absorbed in this story. By puberty, Fièvre’s desperation to leave Haiti pushes her into the clutches of several dangerous men. How she survives and overcomes all these obstacles is a feat of courage and determination, creating a page-turning narrative. Debbie Hagan is book reviews editor for Brevity and former editor-in-chief of Art New England. She is author of Against the Tide, and her essays and prose have appeared in Brain, Child, Boston Globe Magazine, and the anthology Dime Story.